31 Days of Halloween '17 - Day 2 - "Alien: Covenant"
I hated this movie. I hate it with such a passion that it took me four times to finally get all the way through it. I can't stress enough how rare it is for that type of thing to happen to me. Did I mention I hated this movie? Okay, now that we've got that out the way... I'm not sure how this movie was made. Hell, easily the worst film in the franchise, I'm not sure how this even got past the scripting stage. The film is shlock full of actors and then proceeds to not even utilize them to their full potential. This entire crew is on a colonization mission and yet, throughout the movie, the crew that is in charge of keeping those pods of people alive constantly puts them in danger. Danny McBride, after assuming command of the ship since the Captain is below on the planets surface (with his wife) decides to go on a suicide mission to save his wife (who is actually dead so he'd be saving no one). It's asinine. 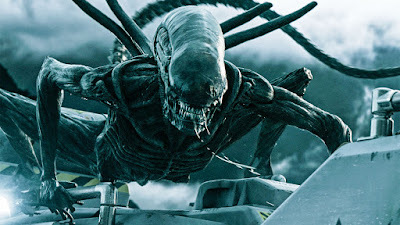 One common defense regarding the movie was that "at least they used a 'man in a suit' for the Xenomorph" and to that I say... did you even watch the movie? 100% of the time there is movement we are treated to a CGI alien. At no point does the creature look real or anything more than a really quick and physics-defying cartoon. Argh!!! This has made me so angry! I'll end this here before I go off on a tangent about how Ridley Scott hasn't made a good movie since Gladiator... too late.